This volume, newly published in paperback, is part of a comprehensive effort by R. J. Rummel to understand and place in historical perspective the entire subject of genocide and mass murder, or what he calls democide. It is the fifth in a series of volumes in which he offers a detailed analysis of the 120,000,000 people killed as a result of government action or direct intervention. 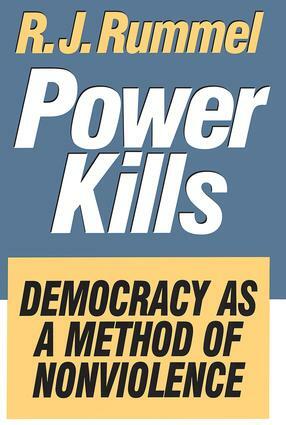 In Power Kills, Rummel offers a realistic and practical solution to war, democide, and other collective violence. As he states it, "The solution…is to foster democratic freedom and to democratize coercive power and force. That is, mass killing and mass murder carried out by government is a result of indiscriminate, irresponsible Power at the center." Rummel observes that well-established democracies do not make war on and rarely commit lesser violence against each other. The more democratic two nations are, the less likely is war or smaller-scale violence between them. The more democratic a nation is, the less severe its overall foreign violence, the less likely it will have domestic collective violence, and the less its democide. Rummel argues that the evidence supports overwhelmingly the most important fact of our time: democracy is a method of nonviolence. What is to be Explained?